Love this set! Not to bright. But just right! Perfect for our new home. Was looking for something for the corner. Have it in my loft and does not take up a lot of space. 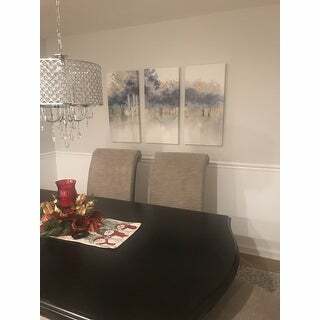 Create a cool centerpiece to your contemporary wall decor with this 3-piece Waters Edge canvas set. Printed using the latest long-lasting Ultrachrome giclee inks, this canvas will grace your walls for many years to come. I cannot begin to describe how gorgeous this triple pic is - it is just amazing! I have a really tall wall and needed something that would command the space -- without overpowering the room. I tried a picture (split into 5 pieces) of the of ocean tide coming in on a tropical beach. Didn't really work for me. And then I found this! I fell in love with it right away, as did my husband. I was so excited when it came, but it turned out the warehouse had only shipped 1/3 of the picture. I contacted Overstock by phone immediately, and they set to work correcting the problem immediately. GREAT customer service by the way! So we waited again, and we were a little nervous, would it be what we wanted? Well, I can only say - what a total show stopper! 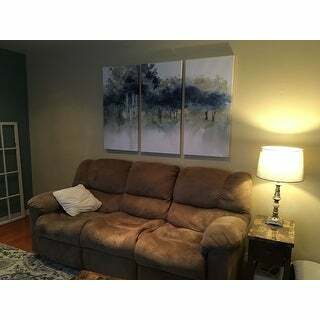 I am just in LOVE with this beautiful and well-executed piece of artwork.I have it hanging over a dark gray couch in my living room, and it's the thing that catches your eye when you walk into the house.So glad I spent the extra dollars for this. Now - was it a tad on the upper side of my budget? Yes, yes it was! Was it worth it? Every blessed dime Dear, every blessed dime! Overstock knocks another one out of the park! WTG team Overstock! this is a very nice grouping. like how its wrapped around the side, so when you put them inches apart the still blend the whole wall. I absolutely love this piece! I have it in my dinning room and its looks perfect. The colors are really nice and has a great pop. I definitely recommend this piece. absolutely perfect!!! pulled all my colors together. I ordered the waters edge II also for the dining area to pull the room completely together!!! cant wait for it to arrive. 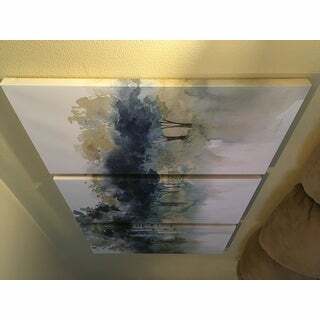 Well made canvas with easy to hang hooks mounted on back. suggest using a level and pencil to draw a straight line the length off all three combined plus i added 2.5" between each picture. took me about five minutes to measure and draw line then about 3 min. to pound nails and hang. have had so mant complements three of my friends are now shopping online here tonight, lol. packed so well!!! I love the serene, outdoor feel it leaves us with. The colors match our home extremely well. I bought both Waters Edge and Waters Edge II. 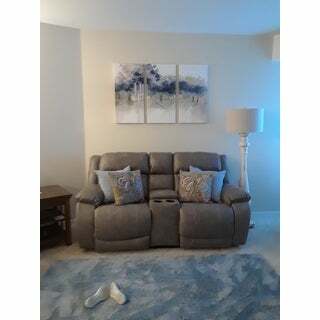 they hang on opposite walls in our living room and we receive many compliments at how nice they look. Gorgeous canvas art very true to color. I would buy from this vendor again! Extremely happy about this purchase. Love love this piece. I'm obsessed with trees And this the perfect piece to with my light grey walls in my home. Peaceful and calm. Quality is great. Canvas is wrapped around as well and including teeth hooks already installed. Well recommended. Waters Edge tryptic exceeded my expectations. The abstract design in blues & taupes is sophisticated & expensive looking. Have gotten numerous compliments. Recommend highly. Love, love , love this piece! Great price (did get it on sale though) for such a large print, beautiful colors and I love the wrap around on the edges. I love this artwork!!! 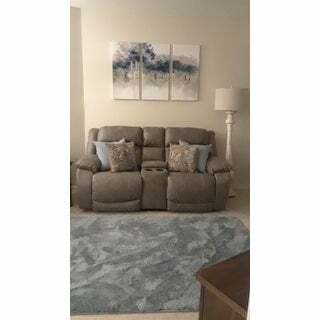 It looks great over my navy sofa in the living room. I love how the image wraps around the sides of the canvas which means the art almost appears as one when viewed from the side, rather than three separate pieces. I needed something impactful for the space. The ceiling height is tall in this room and this art works perfectly. I also have teal accents in the room which coincides with a small amount of teal in the art. My only complaint was that one of the pieces came slightly damaged at the top. I needed the piece up on the wall and decided to live with it. It's so high up I'm not sure anyone will notice. I purchased the largest size of this artwork. Beautiful blue color impact but just too much white on white walls. 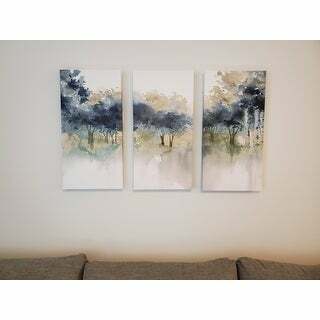 The soothing and peaceful colors on these canvases are exactly what I needed in my dark home. Really brightened up the place! Strikingly beautiful and calming in person. Better than photos online. Highly recommend. I really like this picture. I hung it above grey couch in living room and it looks great. Picture is kind of formal looking but not too formal so perfect for the space where I needed it. It has shades of light and dark grey and various shades of blue in it and looks contemporary. I also like that it's split across three canvases so you can space them apart how ever far you want. Very nice coloring. Went perfect on the wall I had in mind when I purchased it. The art piece was better looking in person. The colors are beautiful, and each piece is so light weight. It'll look beautiful over my bed. This was my first Overstock purchase but not my last! Everything was so easy. These are stunning. The navy trees melt into a lighter blue. I love these and would recommend them. However, I recommend that you have a level to hang them to be able to get them straight. It took me about 15 minutes. They are light enough to hang with a straight pin which does not make a big hole in the wall if you have to adjust. They look absolutely lovely. I just wish they hadn't stapled cardboard pieces on every corner because it took a while to get the cardboard out from the canvas. I ended up having to use pliers to get off the extra staples from it as well so it would lay flat. The flat ones with cardboard are still on them because I couldn't get them off. They're in the wrong order by accident, but that's mostly my fault. well described and product matches exactly. arrived in great condition- was packaged well. This is just the perfect canvas for my living room....the blues match every color of blue in room. I needed something that added a little color to wall above my couch and this is just wonderful. beautiful picture. great size and quality. arrived fast. "Is it framed and ready to hang"
Love the colors and will go great with my decor! "What is the size of the pictures above the bed? Thank you "
"The dimensions reported above for each of the 3 pieces do not add up to the total size stated: 24"X36" TOTAL SIZE - Consisting of 3 Total Panels Each measuring 12"x24" x1.5" deep 32"X48" TOTAL SIZE - Consisting of 3 Total Panels Each measuring 16"x32" x1.5" deep 40"X60" TOTAL SIZE - Consisting of 3 Total Panels Each measuring 20"x40" x1.5" deep What are the true dimensions???" The dimensions do add up, they're just written inconsistently so it's a bit confusing. For the 24" x 36", the 24" is the height, and the 36" is the width of all three panels together. This corresponds to each panel measuring 12" across and 24" tall. So in the TOTAL SIZE, it's listed as H x W, whereas in the individual panel size it's listed as W x H. If you look at it that way, all the measurements add up. "What are the colors in this picture?" It has shades of brown, blue, tan and beige. "Hope this isn't too stupid a question.....in the measurement 24x36, is 24 inches the height and 36 inches the width?" Yes, 24" is the height and 36 " is the total width including all 3 panels. "If we decide we want to return the picture, can we?"